California’s drought is taking its toll on thirsty wildlife. Many sources of fresh water are depleted. Birds and mammals are struggling to quench their thirst. So while I’m happy to let my lawn die while at the same time watering trees with my bath water, I’m choosing to share some of our fresh water with the critters that need it most. Our small, re-circulating water fountain continues to flow. and the newest addition: a pair of dog food bowls. 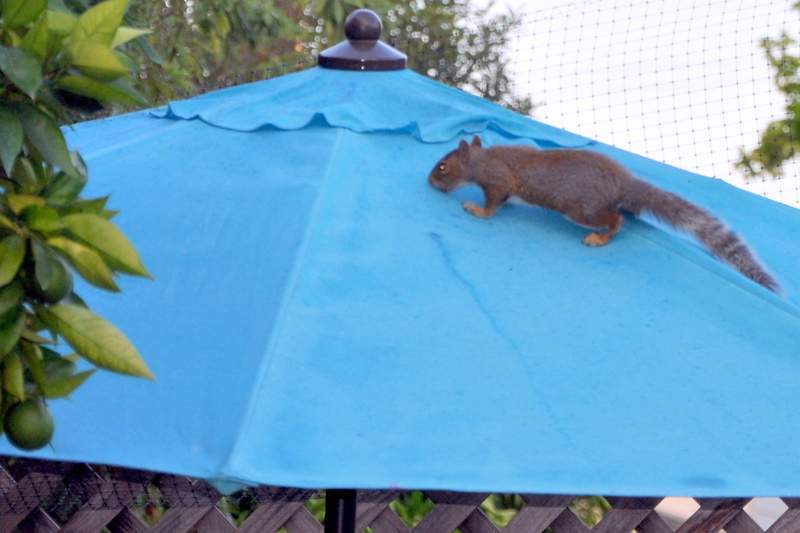 Last week I spotted a squirrel on the patio umbrella, sipping from a rivulet of water formed by the morning dew. I filled a plastic bowl with water and wedged it into the rock wall. Within minutes the squirrel was having a drink. A few days later, a mourning dove swooped in for a drink from our bird bath. They’re large birds, so she couldn’t land on the small bird bath and instead sent the bird bath swinging and sloshing water. 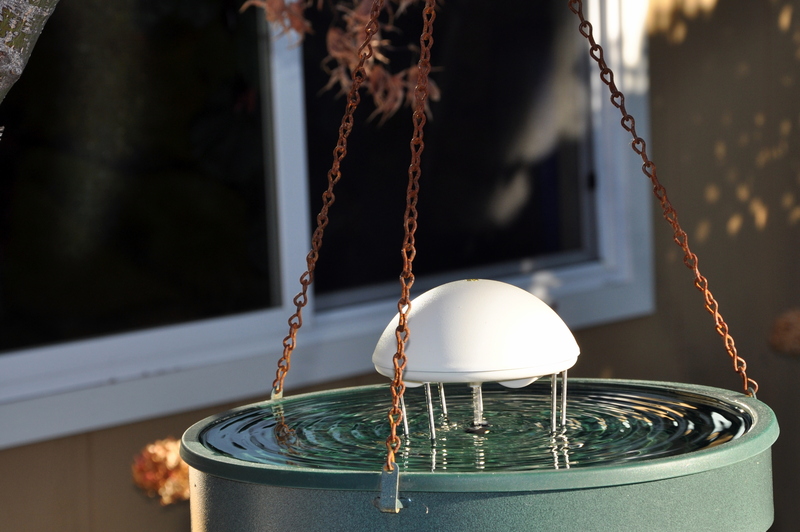 Over the weekend I bought two, heavy-duty dog watering bowls and placed them outdoors on the hutch. 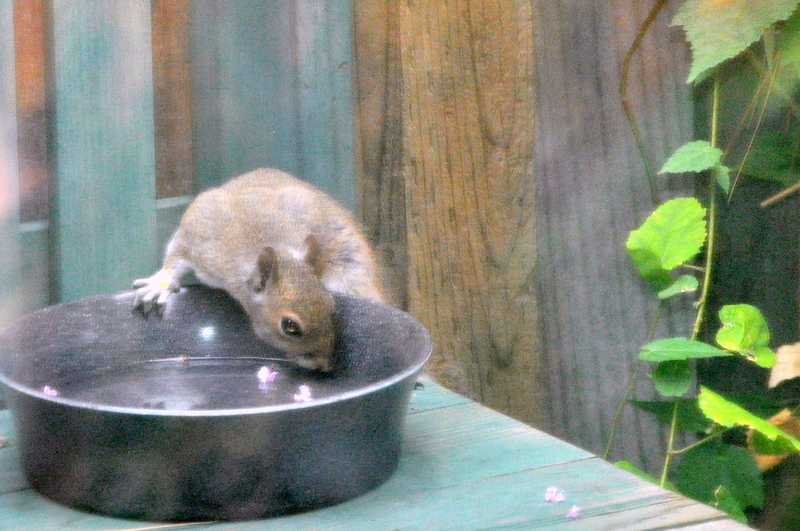 The bowls are sturdy enough that they can’t tip over, but accessible to larger birds, opossums and squirrels. As you can see, above, the squirrels found them immediately. As we draw to the end of another long, hot summer, I’ve become acutely aware of the value of every last drop. If you live in California, I would like to issue a small challenge: The next time you stop to quench your own thirst, think about sharing a bowl of water with the creatures in our midst. This entry was posted in California Drought and tagged bird bath, california drought, garden wildlife, hummingbirds, squirrels, water for wildlife. Bookmark the permalink. 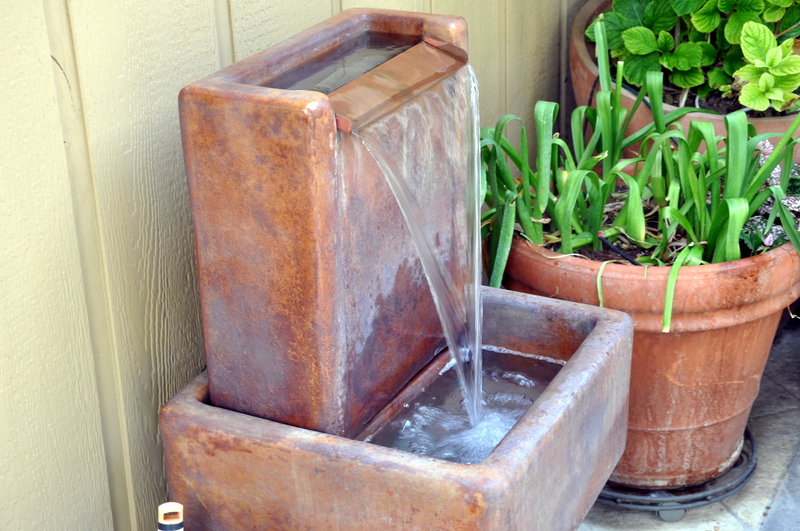 Your fountain adds such a sense of WATER to the garden. Lovely! You birdbaths are wonderful too. We have two fountains, two bird baths and one critter water hole for the wildlife. Even the hawks use it. 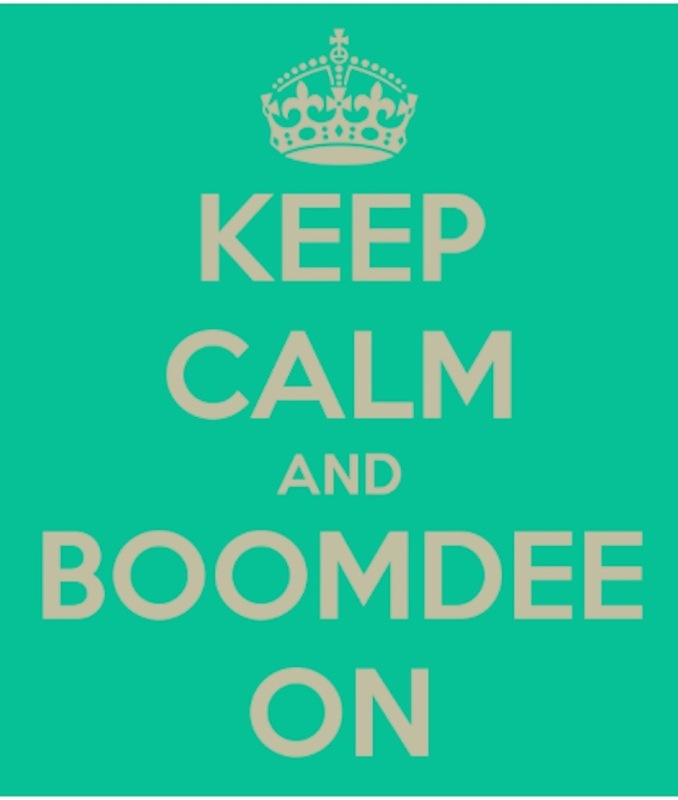 This drought is horrendous and fire season is coming…. This drought is horrendous and I fear for the arrival of the Santa Ana winds. It’s hot and dry here again today, and I suspect it’s the same at the Holler. I would love to see your place one day, Cindy. You are the epitome of someone who walks the walk. So much around you to attract wildlife, with you and your camera there to capture the highlights for us all. Brilliant. This is so thoughtful of you, Alys. So may people wouldn’t see the need or think about it. You are in the society of St. Francis. Lisa, you too are in the society of St. Francis, seeing a need and filling it. You tend a garden and take produce to people in need all summer long. So many people see a need and fill it. I’m no different from wonderful you. I so agree with arlingwoman. You are in a special category because most of us would not have thought about those poor critters looking for a drink. I liked the way you manage to get water out there without attracting mosquitoes. I’ll look into it. I’m too swamped and tired to read blogs tonight, but I always stop at yours. It lifts my spirit so. I’ll do a search of bird baths with water wigglers. 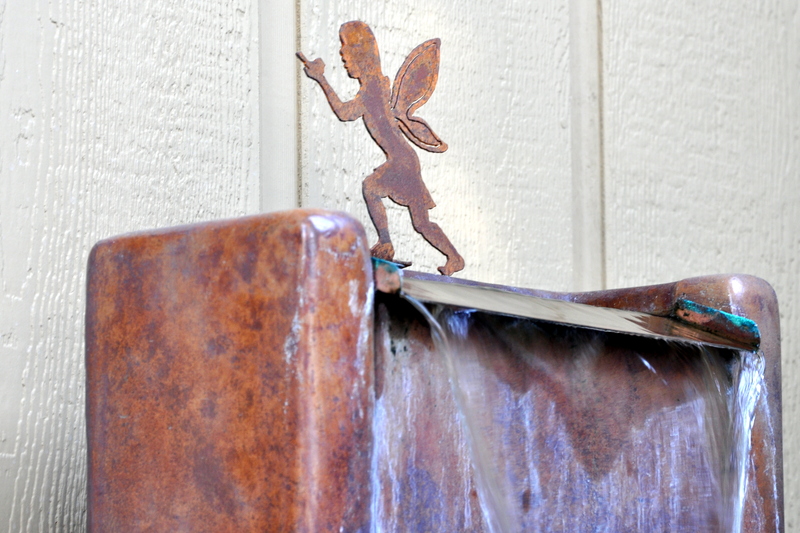 Loved the fairy on your continuous fountain from Boomdee. 🙂 I don’t know anyone with a heart as big as yours.. 🙂 Keep shaking us up. We need it. Hugs and thanks. Marlene, you are gracious and kind. Thank you. For me, providing water just feels like a natural extension of caring for the things around me. Perhaps it comes from going without. I often have an acute sense of my own good ‘fortune’ and always want to extend that goodness out into the world around me. I was listening to a story about the underground railroad this week, and marveling at the risk so many took to help slaves escape to safety and freedom in Canada. The world is full of people doing what’s right and fair, often at great risk. I wish more of that made the news. Good news doesn’t make ratings. Too bad too. So many feed off of others misfortune. Guess that’s why I don’t watch the news for the most part. You are an exceptional person. One I aspire to emulate. I grew up without role models so I’m always still trying to find the people I most want to be like. You are quite high on my list. Higher as I get to know you better. My humblest appreciation Marlene. Thank you, today and always. You’ll see glimmers before 30 but after that, you will be a genius. :))) It took me many years to appreciate my own mother. Then one day the gratitude came for the strength of character her kind of parenting brought me. As I grew, so did my love for her.Funny how that happens. 🙂 Your boys probably won’t take as long as I did. I’m a little thick sometimes. We’re a house full of strong individuals. I may as well get out a multi-year calendar now and start ticking of the dates. I don’t know how the State will get thru this prolonged drought. I skipped over to the link and the photo’s of reseviors are mind boggling. It’s been very smoking in BC and Calgary today due to fires that continue to burn in Washington state. Luckily it hadn’t hit us yet. I’m past worried. My neighbour and I were talking about all these fires, she’s a nurse and said Kelowna and Vernon (south, central BC) are in misery with all the super thick. It was sad to see that squirrel sipping up those little drops. I knew I had to do more. I’m delighted to hear of the party going on in the Boomdee garden fountain. What fun to watch them chatter and swim. Kitty TV…Ha! It seems the entire western seaboard is under fire assault. Everyone is holding their breath for the upcoming Santa Ana winds that cause horrible fires almost every year. I also heard that Colorado is suffering smoky skies from the Washington fires. It’s amazing how the winds knock it about. We had three bad days of smoke, then it all dissipated. I imagine this heavy smoke is brutal for people with asthma and other respiratory problems. I hope they let up soon. We are in a severe drought and the wildfires are in full force in Washington; love your thoughtfulness, we all need a drink and a little bit of help in these tough times. Charlie, those fires are unbelievable. A friend just returned from Seattle and was shocked by how brown everything was. We just don’t think of Washington as a dry state. Tough times for a lot of the west coast. I join my voice with all your other readers Alys and thank you for thinking of the needs of the little creatures and thank you for keeping their needs in front of us. Your kind thoughtfulness never ceases to amaze me. As autumn approaches will things become easier for the birds and animals, will there be more dew and maybe some rain to help ease the situation? A wonderful reminder to provide for the little ones in Nature. I have a bird bath and a water bowl outside. We don’t have a drought but the birds love the water, anyway, and it seems to reduce their need to peck my fruit and berries! 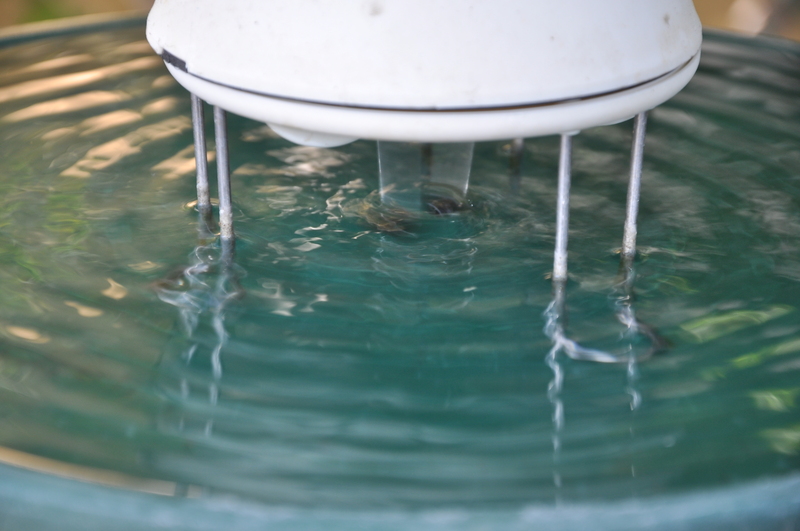 The water wiggler looks like a great gadget. I’m delighted to read about your own bird bath and water bowls. The birds love it year round and as you say, it probably makes a big difference in fruit consumption. Bonus! I love the water wiggler. I think it’s overpriced for what it is, but it works well so I pay it. I knocked this one to the ground in one of my over-achieving moments. I smashed the lid but my husband was able to repair it and it’s working again. Thanks for your well wishes, Johanna. It will be at least October before we can expect any real rain, and possibly not till November. How about you? Have you had rain off and on all summer? I remember the summer rains when we lived in Ontario, Canada. They would come on suddenly and disappear just as quickly. Thank you for your kind words. The fountain is soothing to listen to and can be heard from our bedroom and living room. I’ve seen a hummingbird approach it for a dip, but didn’t have my camera handy. There is nothing like it. It’s so hard dealing with the extremes on either end, isn’t it? We’re begging for rain and you’re begging for the rain to stop. I’m glad you’re enjoying warm days and hope that your extremes have not lead to any flooding. I hope the sun comes out for you and stays out for many days in a row. Is your autumn typically wet, too? September is often nice but, yes, Autumn is usually very soggy. If we get a bad Summer it seems like it’s been Winter all year! Last year was a brilliant Summer, but the Spring brought terrible flooding which took all Summer to dry out! Villages in my county (Somerset) were cut off for weeks and Prince Charles even visited as the situation was so bad. I follow another blogger who had the entire hillside flood down and fill her cabin with water. They’ve had a long year of cleaning and rebuilding. It looked terrible. I wonder if she lives in the same county? She hasn’t blogged for quite a while. I must check in and will let you know if she lives nearby. Thank you for saying so, but truth be told, it just feels like the right thing to do, neither generous nor kind, but doing what’s right. Does that make sense? Absolutely, but no less special on your part. ♡♡ The world could use a dose of doing the right thing. Reading your posts has made this drought so much more real for me, not just something happening on the other side of the country and covered in the news. It’s real and it’s so terrible! Does the predicted El Nino help or hurt? I’m impressed, but not surprised, to hear about your efforts to help animals–so consistent with the impression I have of who you are! Thank you, Kerry. I think that is true of so many things in life: when we know someone close to a situation it takes on more meaning. I felt that when you blogged about the Dannemora prison break. It suddenly seemed so real. The predicted El Nino has a 4 out of 5 chance of working in our favor, historically speaking. The good news is that it is happening (last year’s predicted El Nino fizzled out). The so-so news is that they don’t always bring rain, or they bring too much at once. If I could write the script, I would hope for a gentle inch of rain a day for a month, enough to quench the trees and fill the reservoirs, but not so much that we have mudslides from damaged, fire-ravaged hillsides. It’s a balancing act. So kind of you to give water to your local wildlife. The poor things!